By Abi - Chile - 14 Apr/03 - Viewed 1736 times. It took us a few days to get from Bariloche to Futaleufu. First, we had to go to Esquel, which was about four hours. From Esquel to Trevlin was only about half an hour and we arrived there about 8:00 p.m. We decided to stay there for a couple of nights, since we knew that the best chance of the rafting trip happening wouldn't be until the weekend, if it even went at all. In Trevelin, we went to the hotel the guide book mentioned, which was full and the other two it suggested were no longer in service! The only option left was a private cabin, which would be signifcantly more than what we were used to paying (it was 50 pesos). But, it was either that or to the street with our sleeping bags, so we chose the cabin. We arrived to an adorable little cabin, with it's own kitchen, bathroom (with a whirlpool tub!) and cable tv. We quickly realized it was very worth it, especially when we did the conversion and discovered that we were actually only paying $6.50 more, although it sounds like a huge amount when you go from 30 pesos to 50. I told Travis I felt like I was on vacation from my vacation after my bubble bath in the whirlpool. He was excited about the ESPN Sportscenter on TV where he could get his baseball updates. We just relaxed for two days here, watching movies, playing cards, and reading before heading to Futaleufu for the weekend. We arrived in Futaleufu early Friday morning to discover this sleepy little village was closing down for the season. We met with Chris, our contact and owner of the rafting company, to determine if any other tourists were in town who wanted to raft. There were three South Africans, but they were more interested in fly fishing. Basically, we walked around all day, up and down every street (there weren't many) to all of the little hosterias to see if any foreigners were staying there and to check out their accommodations, as ours was a bit lacking. We did not discover any new people in the town, but were told that a bus was coming in this evening at 6:30. We held our breath hoping that someone would miraculously be on that bus wanting to raft. At that time, it hadn't showed up yet and we were supposed to check back in with Chris at 9:00 p.m. It didn't look good at that point. I should explain that the Futaleufu River is considered to be one of the two best rivers in the world (along with the Zambizee River in Africa). So, we were pretty discouraged that we came all the way to South America with this particular activity in mind and were probably not going to be able to go, so we were trying to console each other! Also, there are no buses out of Futaleufu on the weekend, so we were going to be stuck in this extremely small town, with not much to do for 2 days. However, upon awaking Saturday morning, the se�ora told us during breakfast that there were 3 Americans who had arrived at midnight last night. We were very anxious to speak with them and waited for them to awaken. When they appeared for breakfast, we learned that two were Irish and the other was French, but they all spoke English. We immediately pounced on them to see if they were interested in rafting. They were traveling together and were just really passing through, trying to get to Bariloche. But, after discovering that they couldn't get out of town for two days, they wanted something to do. We all went over to the rafting company (across the street) to talk to Chris. The South Africans definitely decided they were more interested in fishing and Ben and Ruth (the couple) were understandably reluctant to pay the money, as it was more than 3 times their daily budget, although Donal (yes, it's without a "d") was in. After a little negotiating, we worked out an acceptable arrangement and told Chris we had a deal. We agreed to meet at 1:00 to give him time to get the gear all together and, since we knew what all the accommodations were like, suggested that we all go in together to rent one of the private cabins that were available instead of staying at our current place. Ruth, Ben and Donal were all very happy upon seeing the place, which was very well done. There were two single beds downstairs in the main area, a queen bed in another room, and two more single beds in the loft above, complete with kitchen and stove. We were all happy to have a warm, clean place. We met back up with Chris and headed out. Mitch was the guide in our raft, and another guide went along with us (Pablo) and Mitch's wife to add to the weight and number of people in the raft. Chris went down in the kayak as the safety back up. After our safety speech, we encountered our first Class 4+ rapid and were thrilled! The very first rapid we encountered, the water was so great that it just pushed me right back into the lap of the person behind me. I just got back into my position with a big grin on my face. It was fantastic! This section of the river has several rapids right in succession, whereas most rivers have a rapid, then a long pool to get to the next one. Mitch would explain to us what to expect with each rapid, what it's name was, and what to do if you were to fall out (each rapid is distinct in how to maneuver down the river if you get thrown. Sometimes, it's best to get right back in the boat, other times you may need to swim to the right or left). By far, this river is more outstanding than any river either one of us have ever been down. It was rapid after rapid and, although no one fell out, Travis came close two or three times. We were both at the front of the boat and this boat had a pocket to stick one of your feet into. If it weren't for that, I'm sure he would have gone over. There was one rapid in particular that I remember that just engulfed the boat. The water was so high, when we hit the entry point, it crashed down about the middle of the boat. I just remember seeing a huge wall of water and thinking I better hold on! Because it was the end of the season and things were closing down, the photographer was not available like he usually is to take pictures of our specific trip. But, go to www.exchile.com and you can see some amazing examples of what we experienced. We finished that section in about two hours and were so grateful that we had met Donal, Ruth and Ben and it had worked out for us to go. None of them had ever been white water rafting before, so it was quite a fun first time experience for them. They assured us they were glad we talked them into it and had met us! We got back to the village and warmed up in our cabin as Ben, the Frenchman, prepared a wonderful meal for us (and Donal, the Irishman, peeled the potatoes). We all enjoyed spending time together, and later Pablo, one of the guides, came over with a friend to hang out with us for awhile. 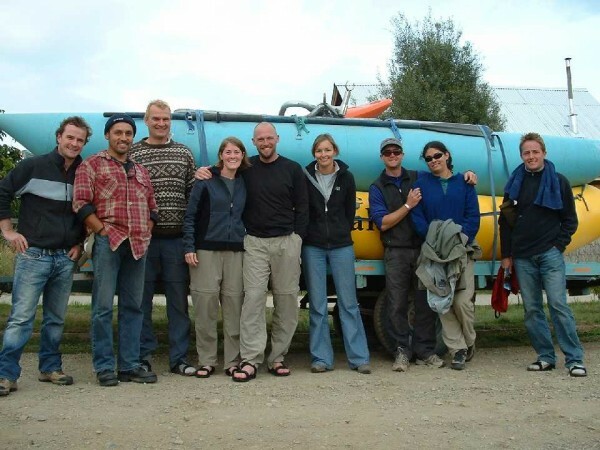 Ben, Ruth and Donal all decided to head out the next morning on foot as there were no buses to see if they could hitch a ride to get to Esquel, where they could then grab a bus to Bariloche. Travis and I thought too much luck would be involved and we didn't think any buses were going from Esquel to Bariloche on Sunday, so we opted to stay in the cabin (she gave us a lower price for just the two of us) and enjoy the town. It's amazing how your attitude changes about a place. On Friday, we were both sort of moping around about how there was nothing to do and lamenting the fact that we weren't going to get to go rafting. After that miraculously worked out, we saw the town with a new light. Oh, how quaint! How beautiful! Look at the mountains, let's go for a little hike! We ended up walking down to the confluence of the Futaleufu and Ospolon Rivers to a beautiful spot. The way the rocks formed the canyon was really neat and to see the water converging on this spot was beautiful. We really enjoyed our time here and the people we met and would love to come back for more rafting on other sections of the Fu. We caught the bus early this morning back to Esquel, where we picked up another bus to Bariloche. We had to pick up my backpack that we left at our hostel, and were hoping to meet up again with Ruth, Ben, and Donal. We thought they were planning on staying there as well, but weren't sure and were so glad when we saw Ben as soon as we walked in the door. We were dying to find out how they had faired hitchhiking. All three had great luck and made it Bariloche in one day, not having to spend the night in Esquel, so we were glad it had worked out for them. We'll have dinner with them tonight before catching our bus to Mendoza, which is 22 hours and leaves tonight at 11:00 p.m.